Who gets moved, and when, depends on the plant and the weather. 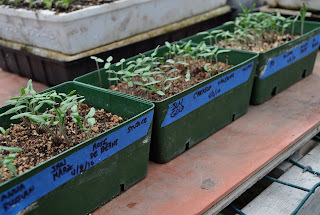 Broccoli, kale, cabbage, and collard seedlings are cold-hardy and almost big enough to transplant. So they’ve been sitting on the table outside the greenhouse since earlier this month. The same goes for celery, artichoke, lettuce, and onion seedlings. Inside the greenhouse, pepper seedlings are growing in cells and tomato seedlings are almost ready to lift out of their furrows in seedling flats for re-planting in individual cells. The tomato seedlings sprout and grow fast, so even though they were sown later, they’ll soon outstrip the peppers in growth. 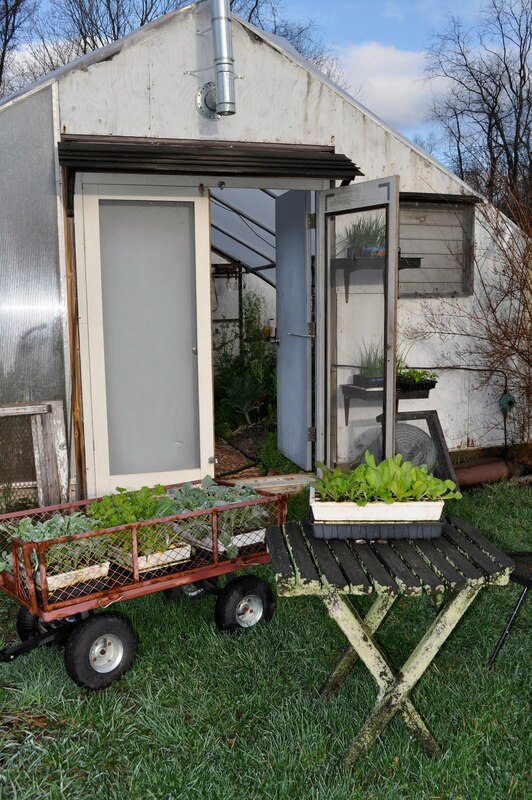 A wrench is thrown into this orderly march of plants within and then outside the greenhouse whenever temperatures drop near or below freezing. Then everything gets hustled back into the greenhouse, which becomes overcrowded with cell packs lining up in paths, benches, and any unplanted space in beds. Odds are that temperatures will plummet, and more than once, before warm weather settles in for good. The average date for the last killing frost around here is the middle of May. For the last few years, that date has been pushed way back into early April – almost. “Almost” because every year for the past few years it’s been warm, warm, warm through April and then bam!, one or two nights in early May get downright frigid, as if to remind me about that average date of the last killing frost. Those evenings I run around throwing blankets over seedlings already planted in the garden and moving seedlings back into the greenhouse. And then it gets warm again, and stays that way. I’m realizing earlier this year than most years that I’ve started too many flower transplants. Usually that realization comes as I’m frantically looking around the yard trying to find a home for the plants in a tray of seedlings I’m carrying around. The genesis of this problem is not hard to fathom. Pictures of colorful flowers, oozing forth from seed catalogs that arrive against the achromatic backdrop of late winter, make purchasing seeds irresistible. Each packet has so many seeds; why not plant them all? And then prick all the seedlings that sprout, or a good portion of them, into individual cells filled with potting soil? And then . . . and then, where to plant them? It’s too early for that final dilemma. All I know is that I now have 40 carnation plants and almost that many each of Lemon Gem marigolds and three different colors of zinnia waiting to sprout. Oh yeh, also some heliotrope, nicotiana, and delphiniums. And I am going to throw some alyssum seed right out in the garden. And I have some butterfly weed and hollyhock plants from last year’s excess that never got planted. And . . . Sometimes I wonder just what “gardening” is. Sowing seeds is definitely gardening, as is transplanting seedlings, making compost, weeding, spreading compost, and pruning. 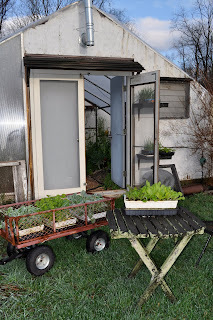 But how about replacing the wood panels of my garden cart, something I should do now and will have to do soon? Or sharpening my grafting knife, also to be done soon, very soon? Or re-building my garden fence, something I am now in the throes of? Or sharpening and trying to start my chainsaw for cutting posts that will hold up that garden fence? It’s a busy time of year. 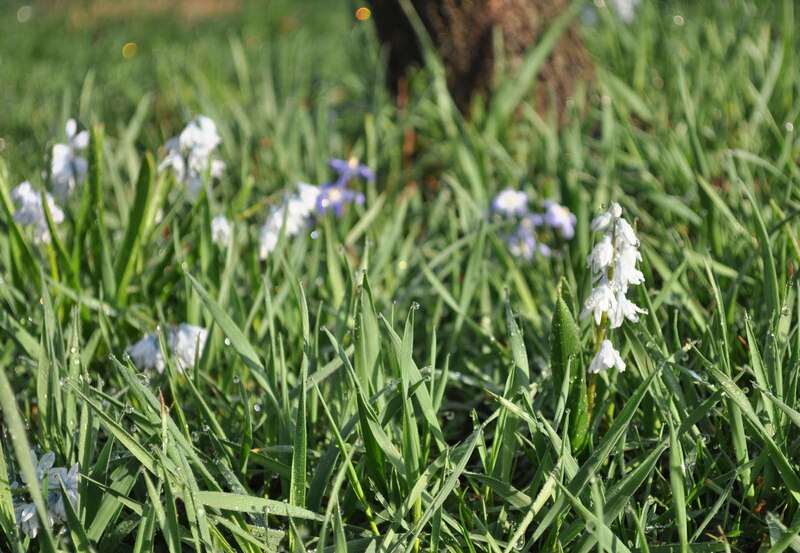 Last week I wrote about looking for the small bulbs I had planted to naturalize in my lawn about 5 years ago. I feared they had petered out. Not so! They all appeared this week (except for the dwarf irises and crocuses marking my old dog’s grave). 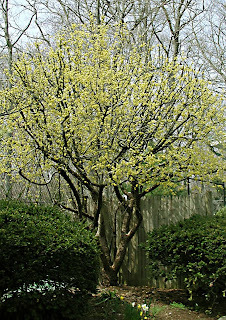 Cornelian cherry also finally bloomed, for some reason almost a month later than usual. Winter cold is all too evident, right now. Or maybe it’s just that spring is later than usual. Here it is, the first week in April, and cornelian cherries (Cornus mas) have yet to bloom. Yet one reason I grow this tree is because its blossoms are among the first to awaken in spring. The stems are typically drenched in a profusion of small, yellow flowers in early spring, just after the middle of March, and blossoming goes on and on for weeks. Everyone else is blossoming on time. Witchhazel has been in bloom for a few weeks, hellebores have opened, and buds seem ready and on time on forsythia, lilacs, and clove currants. 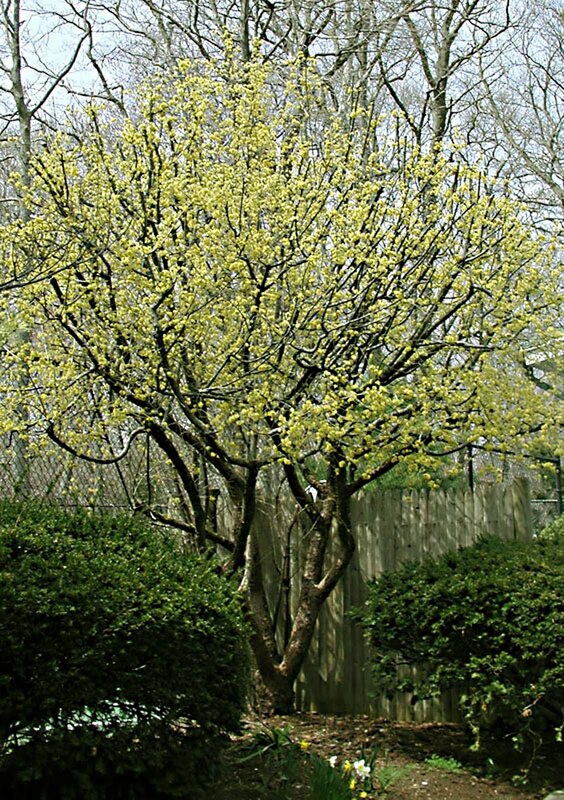 Cornelian cherry blossoms might have been killed by winter cold, although they’ve survived colder winters in the past. Teasing open one of the fat flower buds reveals the makings of yellow flowers, so perhaps they are just late this year. I hope the flowers are merely still resting because, if so, they will be followed by fruits that look and taste like tart cherries. Like the flowers, they’re also borne in profusion, and decoratively hang from the branches for a long time unless harvested. 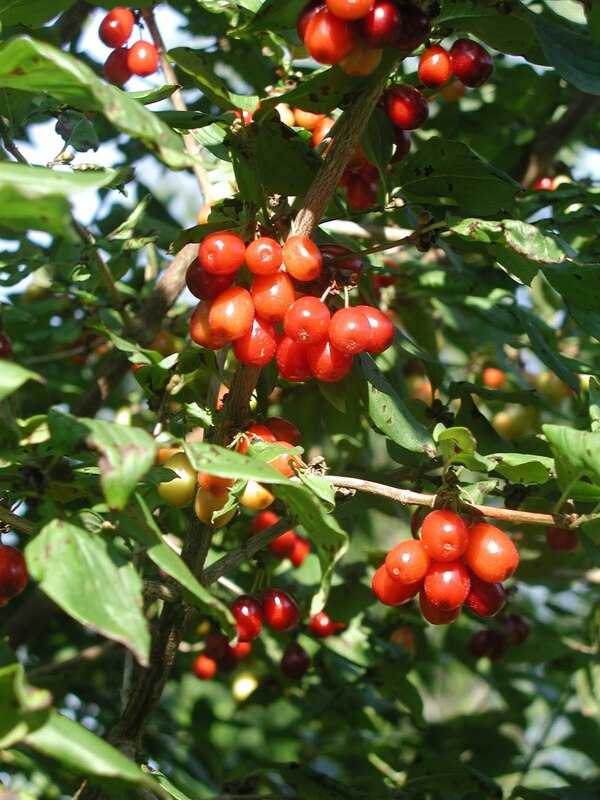 Unlike tart cherries, cornelian cherries fruit very reliably with little bother from any pests. Other evidence of this past winter’s cold – unrelated to the lateness, or not, of spring – is bamboo. 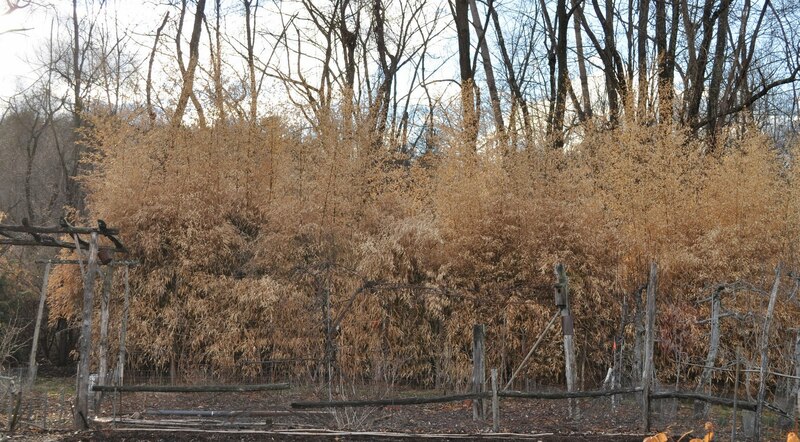 Today was overcast and rainy, and driving back from having my truck inspected, I couldn’t help but note patches of winterkilled bamboo in various yards. The clumps of upright stalks draped with now-tawny leaves, very attractive as a muted prelude to the exuberance of spring blossoms, really jump out in the landscape once you start looking. Soon bamboo will shed its dead leaves and become unattractive, a brief phase that ends as soon as new shoots poke through the ground. They grow very quickly – I’ve measured 6 inches a day of growth – and are quickly clothed in fresh, green leaves. Particularly welcome and, I think, on time are some blossoms that are not even colorful. Those blossoms are the catkins on my filbert bushes. They are brown but drape decoratively down from the branches like the tails of cats (actually kittens, the origin of the word from the old Dutch word katteken). 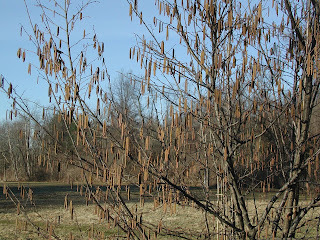 Catkins are spikes of flowers, all male in the case of filberts. The female flowers are hardly noticeable until they start developing into clusters of nuts. My filberts are European hybrids, the nuts of which are large and tasty. Years ago I grew some native filberts (Corylus americana), which bear nuts that are really too small and not tasty enough to be worth eating. The reason I planted them was because they are resistant to filbert blight disease, a disease indigenous in eastern U.S.. European filberts (C. avellana) are grown commercially in the U.S. in the Pacific northwest, where the disease was absent. Note the phrase “was absent.” Filbert blight started showing up in those parts in the 1980s so breeders there started looking for and developing resistant varieties of European filberts. Actually, some eastern filbert enthusiasts had bred some fairly resistant varieties, such as Graham Hybrid, Gellatly, and Hall’s Giant, all of which I planted almost 15 years ago. They bore well but got some blight. The breeders in Oregon came up with some new varieties that are immune to the blight. Long story short: I’ve been enjoying large, tasty filbert nuts in autumn and the-catkin draped branches early each spring for a number of years. The varieties I now have are Lewis, Clark, Yamhill, Jefferson, and Santiam. That’s a lot of nuts! More nuts. Hickories are delicious (a close relative of pecans) but a hard nut to crack and, once cracked, yield little nutmeat. 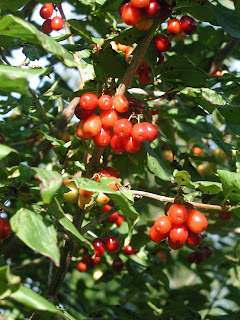 I recently read an article about improved varieties of this native tree, varieties whose nutmeat crack out in halves. I just ordered trees of the varieties Selbher and Henning. Finally, after a couple of weeks of restraining myself, I’m sowing tomato seeds. Every bit of warm weather and bright sunshine made it harder to hold back, but the time has come. The problem – if it could be called a problem – is that tomatoes grow pretty much like weeds. The seeds germinate quickly and the seedlings grow fast. So what typically happens is that seeds are sown too soon and the seedlings get too big for their pots before transplanting time. Too big, that is, unless you keep repotting them. Repotting becomes a space issue when you grow 50 or more tomato plants, as I do. I grow my plants in my greenhouse but for anyone who raises tomato seedlings on a windowsill, plants seeded too early tend to get too leggy. It’s hard to grow nice, stocky seedlings in the limited light of even a sunny window. Not impossible, though, if the room is kept cool (mid 60s), if the plants are near the window, which is south-facing and unobstructed, and if you pet the plants daily. Yes, pet the plants! Running your fingers or a short length of plastic pipe gently over the tops of the plants a dozen times or so daily does the same thing that wind does to plants on wind-swept, craggy, cliffs: It stimulates release of a plant hormone, ethylene, which inhibits stem elongation. Breezes from the ventilation fan and bright sunlight in my greenhouse keep my plants stocky; I still occasionally pet them. April 1st is my tomato-seed-sowing date, which allows 6 to 7 weeks of growth before transplanting time. The plants start off slowly, then pick up steam quicker and quicker as temperatures warm and sunshine grows brighter. Last year, I grew 80 plants, which provided plenty of tomatoes for fresh eating, sauce, salsa, and ketchup (the last item a failure, but it did use up a lot of tomatoes). This year, 50 plants should suffice. What could be cheerier than the flowers of crocuses, dwarf irises, and other small bulbs popping up out of the ground now? These flowers, no matter how small, are really appreciated after a colorless winter. Five years ago, I planted a slew of these small bulbs, also including species tulips, chionodoxa, muscari, puschkinia, galanthus, and scilla. Some went into mulched ground beneath the apple trees, others went into the soil in beds where I’ll soon be planting vegetables, and still others were planted right into lawn. The bulbs that went into vegetable beds and mulched ground have, as expected, grown most vigorously and are now tight clumps of flowers. Plants “plugged” into lawngrass are less vigorous because of competition for nutrients. Water is not a factor because the soil stays plenty moist during the few weeks in spring that these small bulbs are flowering and then growing leaves to feed next year’s flowers. A number of bulbs seeded in lawn have died out. Perhaps it was the competition. In the front yard, our annual floods, which have been deeper than usual over the past few years, probably snuffed out already weakened plants. Especially missed is the rectangular planting of Iris ‘George’ (a hybrid of Iris histrioides and I. reticulata) and crocus ‘Clothe of Gold’ (a variety of C. angustifolius dating back to 1587) that marked the grave of our old dog Stick. Turning to warmer thoughts . . . 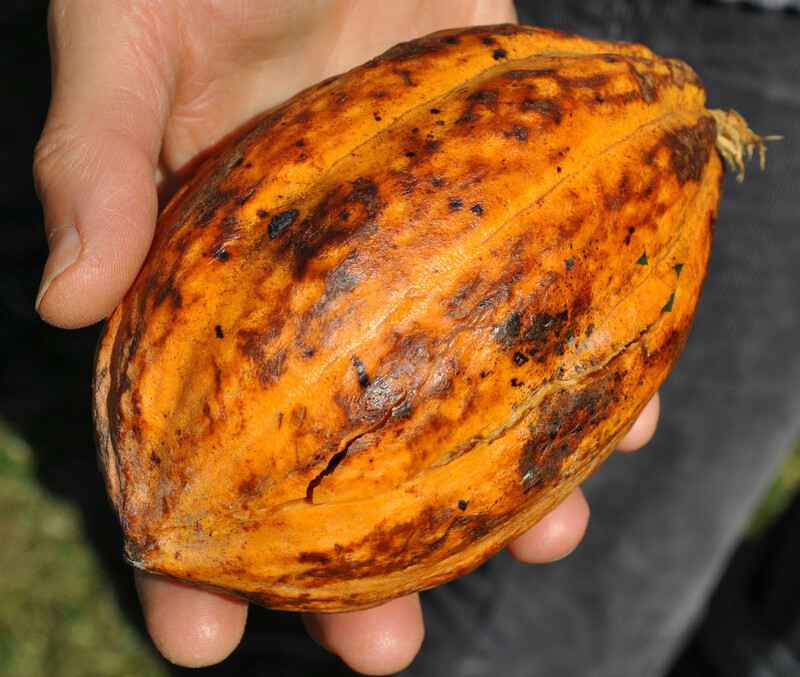 Joining me on my return from last week’s trip to Puerto Rico was a chocolate pod. The orange pod dangling from a branch at the USDA research station was too irresistable to leave hanging. After much effort climbing branches and whacking at the pod, I finally landed it on the ground. 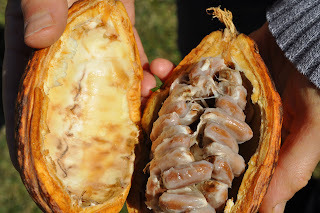 I’ve cut the pod open to reveal the seeds, some of which I planned to sprout and others of which I planned to process into a primitive chocolate. Now I’m having second thoughts. The trees are truly tropical, needing constant heat, ideally over 68° F. Neither my house nor my greenhouse temperatures remain consistently that high. The plants do, at least, tolerate some shade. Even if I got the seedlings to grow to their 5 foot fruiting height, making chocolate involves a rather complicated process of fermentation, drying, cleaning, roasting, and pressing. I think I’ll just buy some finished chocolate instead. But what to do with this intriguing pod and seeds? Night temperatures are still usually dropping well below freezing, as they will for the next few weeks. No matter, because where I am, it’s like summer. Puer-r-r-r-to Rico! Here day temperatures hover in the low 80s, night temperatures in the 70s. Gentle breezes rustle the leaves of palm trees and make these temperatures even more comfortable. It’s the dry season, especially here in the southeastern portion of the the island, with daily chances of thundershowers meaning nothing more than brief cloudbursts after which beaches, roads, plants – everything – dries quickly. Still, grasses in pastures have that bluish, dry look. Majestic mango trees weighed down with unripe fruit await wet weather in coming months to burst into flowers in preparation for another load of fruit. This winter’s low of minus 20° F. killed off the tops of my bamboo so I expect this year’s growth from the roots, which do survive, won’t match the 20 foot culms that grew last year. Even at 20 feet, these tall culms don’t hold a candle to some of the tropical bamboos down here in Puerto Rico. A tour of the U. S. Department of Agriculture research station in Mayaguez let me see a number of tropical bamboo species all in one place. Most dramatically impressive were a couple of the larger species. 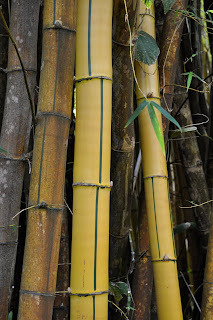 I’m happy with inch-thick culms from my Phyllostachis aureosculcata plants, a species that is among the hardiest of what I call “timber bamboos.” What a joke, my calling these “timber bamboos.” Bambus vulgaris and Guadua angustifolia culms reach about a half a foot across here in P.R. I would estimate their culm height at about 60 feet. Ah, the things I could do with such plants. I use my P. aureosculcata canes for some building projects such as lightweight fencing and poles for climbing beans or tomatoes. With those tropical bamboos, I could build a whole house, or, at least, a very decorative garden hut. In fact, Guadua angustifolia is used for construction. Bamboos generally are fast growing plants. A major difference between most tropical bamboos and most temperate bamboos is that the temperate species spread aggressively via underground runners that scoot along horizontally just a couple of inches or so beneath the ground. I’ve seen culms pop up from runners that have spread 5 feet away from my plants in just a few weeks. Thoroughly digging up these runners is not easy because they are as tough as the culms. 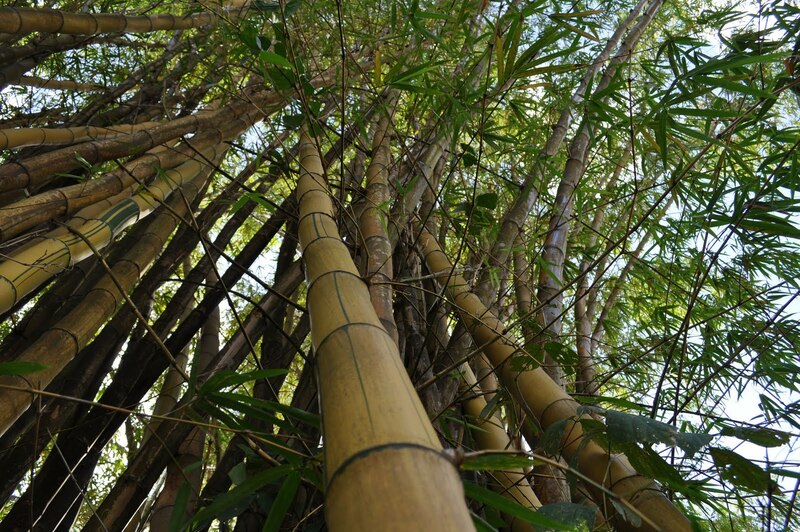 I contain my bamboo with a plastic barrier that extends from a couple of inches above ground to 2 feet down into the ground. Still, the runners sometimes creep over the top of the barrier after which I have to pull and dig up the tough lacework that quickly develops just beneath the ground surface. These topical species would be downright frightening if they spread like the temperate species. Instead of spreading, they grow in well behaved clumps. Clumping makes that impressive Bambus vulgaris even more impressive, the culms soaring skyward and then fanning out like a fountain. 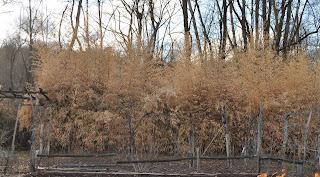 As if that wasn’t enough, the variety Vitatta that I saw has yellow culms with forest green lines seemingly brush-stroked – one, two, or three of them – vertically between some of the nodes. The U. S. Department of Agriculture research station here in Mayaguez also houses the collection of temperate zone bamboo species, including my own Phyllostachis aureosculcata. What a sorry site! The culms were 8 to 10 feet high and looked somewhat piqued. 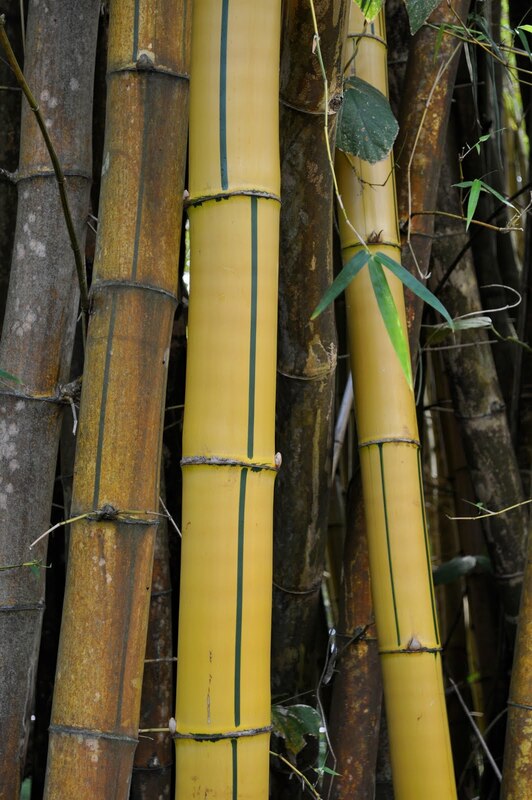 These bamboos, like most other temperate plants – perhaps even some people – don’t thrive with perennially hot weather. They (and we) need their (and our) dose of cold weather each year. Easy for me to say, down here in La Isla Encantada. 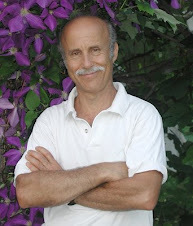 Lee Reich, PhD worked in agricultural research for Cornell University and the U. S. Department of Agriculture before moving on to writing and consulting. He grows a wide variety of fruits and vegetables on his farmden (more than a garden, less than a farm), including many uncommon fruits such as pawpaw, hardy kiwifruit, shipova, and medlar. 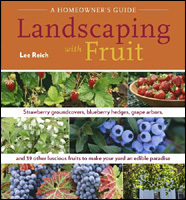 For more about me and my work, photos of my garden, and a place to order signed copies of my books, go to www.leereich.com.